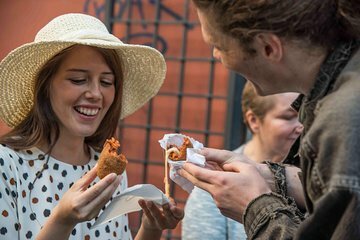 Verlassen Sie den typischen Touristenpfad und begeben Sie sich auf eine Verkostungstour durch Roms Viertel Trastevere und den Markt Campo de 'Fiori. Treffen Sie Ihren Reiseleiter und seien Sie sicher, dass Sie hungrig sind: Die vom Chefkoch entworfene Reiseroute enthält viele Proben. Probieren Sie Pizza und Käse aus der Region, essen Sie Pasta und lernen Sie die verschiedenen kulinarischen Traditionen kennen, wenn Sie das jüdische Viertel der Stadt erkunden. Während Sie gehen, haben Sie auch die Möglichkeit, einige Sehenswürdigkeiten zu besichtigen. A GOOD WALKING TOUR. jUST THE GUIDE AND TWO OF US. We arrived at 9:30 am for a 10:00 am tour. We waited at the designated area at Piazza Trilussa until 10:30 but no tour guide showed up. We called the phone and a kind Italian woman we met on the street also call for us and the was not in service. Sarah was an outstanding tour guide. We booked the chef designed tour not knowing much about Italian food. By the time the tour ended we not only learned the history of the Jewish Ghetto and Trastevere area, but were informed about the periods of buildings from different eras as well. We found this to be an informative way to learn about the area and how it was built up in Rome, referring to why certain foods were made in certain areas. We began the tour in a bakery. The savoury sandwich was a one of a kind. In fact we don't have the bread nor meat in our country. This was a favourite stop of ours on the tour. Moving on to the cheese store we tasted the best cheese ever, it was fresh. As a matter of fact it was made the same day! The other cheese and meat selections were very tasty as well! We loved this shop. While in Italy we will try to make time to buy a large portion of the cheese! Italians love suppli and we now know what they serve for a gathering in their homes. We got to taste the snack and it was very good and the way one would want to eat it hot. Italians eat dessert according to the area they were raised in. We had a selection of cookies from a bakery and can now compare the variety of baked goods whether plain or sweet. Before another highlight of our trip we tried some meat in the Jewish Ghetto. It was another selection of food that was new to us. How the Jewish eat the meat and bread was a very good idea. We will absolutely take this idea home with us and share the idea with our friends and family. Another highlight of our trip was the dessert at the end of the tour, what a great way to top it off with a taste to remember this one of a kind tour! It was unique seeing the dessert made in front of you through the bakery window. Sarah speaks English well. We strongly recommend booking Sarah for your tour guide while in Rome. The chef designer food tour is a truly unique tour that one must book!